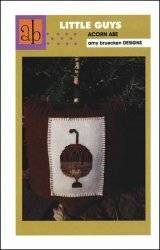 Little Guys: Acorn Abe [E5962] - $6.00 : Yarn Tree, Your wholesale source for cross stitch supplies. A Little Guy in a big acorn. Stitched on #7145 French Polka Dot. Stitch count 30 x 63.